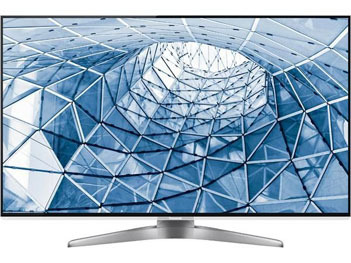 In 2012 Panasonic is greatly expanding their line up of LED back lit LCD televisions, in the past Panasonic has left larger izes and top tier features to their plasma televisions but this year they have large LED TVs like the flagship WT50 series. The TC-L47WT50 is a 47", 1080p IPS LED Panel with 3D compatibility and 1920 back light scanning for improved performance in fast motion scenes. It also has the full Viera Cast online suite. The picture quality on the TC-L47WT50 is excellent with strong black levels, high contrast and superb color performance. The 1920 backlight scanning virtually eliminates blurring in fast motion scenes and Full HD active 3D gives you maximum detail with 3D content. The WT50 series has a 240Hz and the the back light is manipulated to give a simulated response rate of 1920Hz. The TC-L47WT50 uses this to smooth out judder and remove motion blur from fast action scenes. The 24p cinema smoother takes 24p film content and interpolates extra frames into the content to smooth out the judder sometimes found when showing 24p content on televisions with a base 60 frame rate. 24 does not go evenly into 60 so conversion is handled by the TV's processor. In the WT50 series the 24p Cinema Smoother is what handles the conversion and smoothes out the display of 24p content. The WT50 has Full HD active 3D, this means that it shows a full 1080p images to each eye for each frame of 3D content. This increases detail and picture depth in the TC-L47WT50. Panasonic's WT50 series has 10 zones of edge lit backlighting local dimming as one of the more advanced features from Panasonic LED Televisions. A 1920 backlight scanner is included with the WT50 series. This improves resolution during fast motion or fast action scenes. The WT50 has a very modern appearance, from the front the panel glass seems to go all the way to edge thanks to a very slim bezel. There are brushed metal accents on the side of the panel that match the ultra-modern, curved, 2 legged stand. There is also a bit of clear acrylic accenting at the bottom of the bezel. The WT50 is extremely slim at about a half inch in depth. The WT50 includes many new features in the Internet world such as Popular sites, including Netflix™, Amazon Instant Video™, YouTube™, Pandora®, Twitter, Facebook, Bloomberg News, AP, Wall Street Journal, Accuweather® , Skype™, Wealth TV, CinemaNow, Hulu Plus™, sports sites Fox Sports, MLB, NBA, NHL and MLS(2) ,BodyMedia and Withings continue on VIERA Connect and are joined by a host of exciting features and apps, all optimized for the best possible user experience. On November 1, 2011, Panasonic introduced an app, Social Networking TV that allows one to access social network sites such as Twitter and Facebook, while simultaneously enjoying programming on their VIERA HDTV. Gaming application from PlayJam and a movie/video channel dedicated to Bollywood, called BigFlix. PlayJam is a game channel with multiple game apps. With ease of use as a major focus, VIERA Connect's interface implements quick keyword input (like a cell phone) to help retrieve favorite content faster and easier. This allows use of all kinds of media through the SD card slot included on the screen. Digital images or HD videos are popular choices. The WT series has the additional touch pad controller. It is in addition to the normal remote control and controls the TVs Apps or options through a touch sensitive pad on the very small "mouse" like remote. A new option for 2012, the sound quality is greatly enhanced by this feature which makes the sound seem as if it is coming from the center of the screen.